Organizations are increasingly deploying apps and microservices using container technologies such as Docker instead of virtual machines for three key reasons: simplify configurations, increase productivity, and shorten deployment times. While containers value often focuses on speed, agility and automation, the underlying network aspects with common tasks like IP address provisioning and de-provisioning often cannot handle the dynamic and rapidly changing container environment. Infoblox DDI for Docker and Containers extends our industry-leading DDI solution to microservices to increase control, security, and automation. The Infoblox DNS, DHCP, and IP address management (DDI) solution can now be extended to support Docker and other Linux- and Unix-based containers using CNM and CNI. With Infoblox Actionable Network Intelligence, organizations using container receive more control and security by leveraging the pre-built integration for IP address management (IPAM). The centralized and automated management of the organization’s IP space improves efficiency by offloading network responsibility and assignment from the application developer with logical integrations. In addition, automation avoid IP conflicts and container routing issues by eliminating human errors and empowers network and operator visibility into the container cloud. 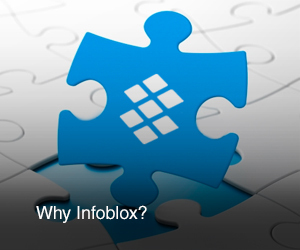 Infoblox allows you to control DNS, DHCP, and IPAM for complex, distributed physical, virtual, cloud, and container environments centrally, flexibly, and efficiently. Now you can support multi-platform workloads in Docker, VMware, AWS, Azure, OpenStack and others with confidence and maximize the full potential of your deployment strategy. We are the industry-leading platform for DNS, DHCP, and IPAM, and the Actionable Network Intelligence platform is the only solution that offers built-in adapters, automated discovery, and out-of-the-box integration for leading virtualization and cloud platforms including Azure, AWS, VMware, OpenStack and Docker. Instead of using legacy DNS and IPAM options, automate the provisioning of IP addresses and view the dynamic microservices in Docker. Manage and visualize your DNS, DHCP, and IPAM on a unified user interface or via APIs. Provide local controls and empower individuals or departments by delegating DNS authorization to these departments. Why build your own customized API hooks when you can leverage pre-built integrations with Docker and other automation and orchestration platforms? Meet API scaling requirements by using a distributed approach to handle peak loads while maintaining complete control. Eliminate the challenge of tracking and auditing of dynamic containers and VMs by continuously identifying and documenting virtual assets across multiple platforms with an automated discovery process. Track and audit current and historical instances to ensure compliance and maintain consistent policies.